Off the Shelf Guest Post: Red White and Green "Lasagne"
This month's Off the Shelf guest post comes from the always wonderful Micha from Scraping the Skillet. I can't say enough about how much I love her blog, so go have a look and I'll let her post speak for itself! First, let me mention how excited I am to be presenting a guest post here on Cooking Books! I first discovered her space on the web through a mutual interest in Pflaumekuchen. A few internet exchanges later we learned that we actually went to the same college - it sure is a small world! 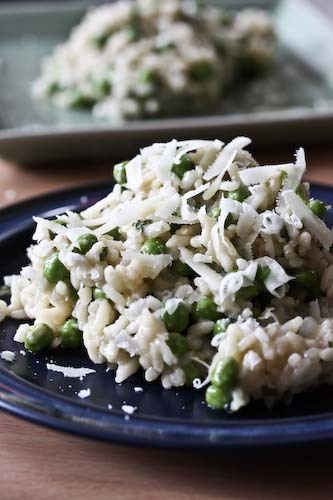 Andrea makes such a wide variety ofinteresting, unique and tasty recipes that I look forward to each of her posts. This is my attempt to fit in! The book I am cooking from, Kurt Beecher Dammeier's "Pure Flavor," is one I picked up this past summer when we were up in Seattle visiting friends. We were at Pike Place picking up some fresh treats to bring to a friend's house for dinner and stopped into Beecher's for a snack. For those who don't know, Beecher's Handmade Cheese is an a small shop in Seattle's Pike Place Market where all the cheese is made on site. They feature a wide range of cheeses for sale as well as a few standard food items, including their AMAZING "World Famous Mac & Cheese." If you are a turophile and you've never visited, I highly recommend it. Even if it's only so you can pick up a block of their Flagship cheese or grab some cheese curds to snack on. I'm salivating just thinking about it. From the moment I first locked my eyes on this recipe (while reading in bed that night at our friend's place) I knew I wanted to make it. For one, it's all vegetables, which is very appealing to me. It's also so different than anything I've seen before or since. I love beets and cauliflower, and was very excited about presenting them in this way. The recipe was a bit time consuming, but some parts could have been prepped ahead, which would have made things go a little smoother over all. I made a few small changes, which will be noted in the recipe below. Overall, this was fantastic. In fact, Dylan commented that it was "like when you get something really different at a super upscale restaurant and then it totally blows your mind." I hope you enjoy this one as much as we did! 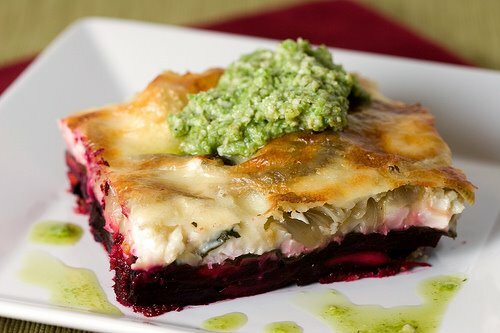 Red, White, and Green Vegetable "Lasagne"
Serves 12 as a side dish, 8 as a main course. Preheat the oven to 425. Bring a large pot of salted water to a boil. Have ready a large bowl filled half way with ice water. In a large bowl, combine the beets, thyme, olive oil, 1/2 t salt and 1/4 t black pepper. Spread the beet mixture on to a baking sheet (I lined mine with parchment). Roast for 25 minutes, stirring once, or until the beets are tender (I found 35 minutes was perfect). In a large saucepan over medium heat, melt the butter and whisk in the flour. Slowly add the milk, whisking constantly. Add the cayenne, garlic powder, 1/2 t salt, and a dash of black pepper. Cook until the sauce thickens, about 10 minutes, stirring frequently. Remove from the heat. Add the semihard and semisoft cheeses and continue whisking until the cheese is completely melted. Set aside. 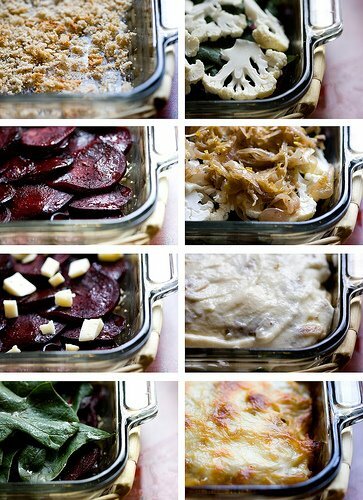 Remove the beets from the oven and set them aside. Reduce the oven heat to 375. Butter a 9x13-inch baking dish.Sprinkle the bread crumbs over the bottom of the baking dish. Place half of the beets on top of the bread crumbs in one overlapping layer. Arrange half of the blue cheese in large chunks on top of the beets. (We didn't have any blue cheese! I thought we did, but it had been eaten! Instead I used a mixture of Asiago and Fontina, which was good. i think it would have been even better with the blue cheese.) 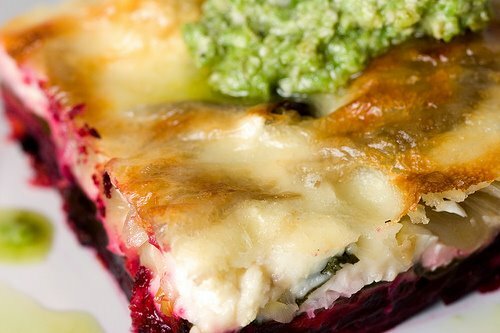 Make a second layer with the remaining beets and blue cheese. Drizzle 1/4 c of the cheese sauce on top. Place the beet greens (or spinach!) on top of the cheese sauce. layer the cauliflower, 1/4 c of cheese sauce, and then the onion confit. Top with the remaining cheese sauce, spreading it to the edges of the dish and covering any exposed confit. Bake, uncovered, for 40 minutes (I baked ours 50 minutes). Let the lasagne sit for at least 20 minutes before slicing and serving. Serve with a generous dollop of Green Bean Pesto. The recipe said this makes about 1 cup. I found it made 2 cups. I'm pretty excited about having the leftover for cheese and cracker snacking, though! Heat the oil in a large saucepan over medium heat. Add all the ingredients to the pot and stir. Cook the onion mixture, stirring occasionally, for 45 minutes. Reduce the heat to low and continue cooking for 15 minutes, or until the onions are soft, brown, and reduced. Can be used in any of the ways you typically use pesto. Blanch the green beans in boiling salted water for 1 1/2 minutes. Remove them to an ice bath and then drain them in a colander. Transfer the beans to the bowl of a food processor and add the garlic, salt, and pepper. Puree for 30 seconds and add half of the oil while the motor is running. Add the pumpkin seeds and the remaining oil and process for 10 to 15 seconds, until smooth. Beautiful and delicious! I love a decadent vegetarian dish. I'll have to look for the book. Yum! I love anything that combines the earthy flavors of beets and blue cheese. A killer combination. I made a root vegetable tart one year at Christmas, with blue cheese, goat cheese and rosemary...I thought it was superb (and they layered rounds of root vegetables in orange, red, white and candystripe is stunning) but it turned out I'm the only one in the family who likes beets. Sigh. Lisa, check out the book and definitely Micha's blog, if you haven't yet. YOu'll love it! Wanderers' Daughter, you do love earthy flavors, and that vegetable tart sounds amazing. If you ever make it again, you should post on it, either on your blog or on mine! Wow! this looks and sounds fantastic. I never would've imagined using beets for something like this but I'm they go perfectly. Thanks for sharing such an inspirational recipe!